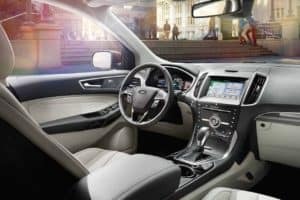 The new 2018 Ford Edge is ready for action at Tomball Ford. 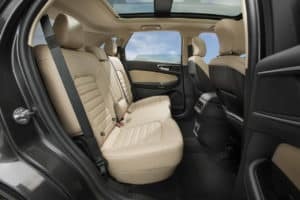 It’s an exciting and unique midsize crossover SUV. The Edge is distinctive because of its refined looks and great fuel efficiency. It achieves up to 29 mpg highway with an impressive Twin-scroll 2.0L EcoBoost I-4 turbocharged, direct-injection engine.This engine delivers tremendous power, putting out 245 horsepower and 275lb.-ft. of torque. The Edge’s performance can be attributed to its engine’s technology, including an integrated exhaust manifold and an active oil-control system. This auto, and its ingenious engine technology, can be yours starting at only $29,220. 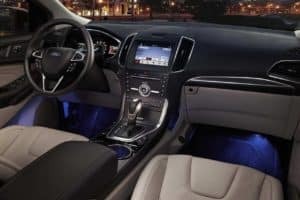 The 2018 Ford Edge has muscular exterior body lines that give it a memorable silhouette. LED tail lamps are standard and they look great on the Edge’s rear surface. 18” Sparkle Silver Painted Aluminum Wheels are also standard. These nicely elevate the vehicle’s cabin to give you excellent visibility on the road. 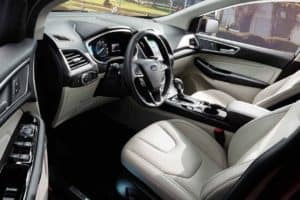 Riding inside the 2018 Edge is a comfortable experience. You and your passengers can easily stretch out in the Edge’s ample cabin. 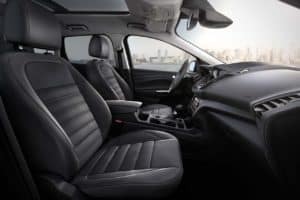 Overall, the roomy interior has an upscale feeling, with premium touches. The front console is beautiful looking, and is designed to give the driver comfort and control. The steering wheel also has a plethora of functional and practical controls, so your eyes never have to leave the road. Storage pockets and cup holders are all within easy reach. Single zone climate control is standard. Enhance your new Edge with an available trim. The SE Edge comes loaded with a ton of standard features. 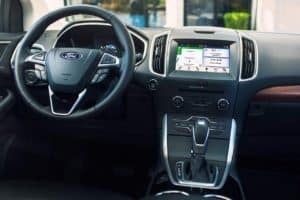 We already mentioned the SE’s powerful 2.0L EcoBoost engine, but the SE also includes auto start-stop technology that improves the vehicle’s fuel efficiency when idling. 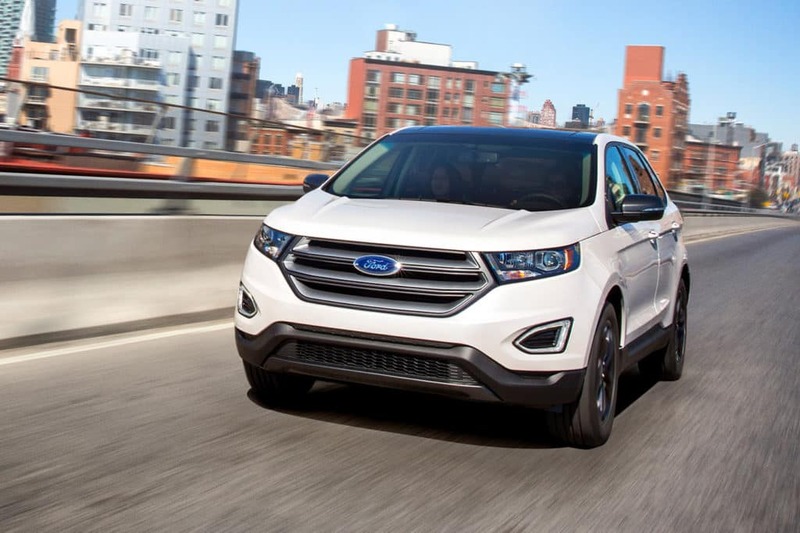 The SEL trim has an available Sport Appearance Package that complements the Edge’s design with a unique grille, rear spoiler, skid plates, and more. This model also features a 60/40 split-fold-flat bench seat. The 2018 Edge Titanium model has several features that are very practical for everyday driving. It includes a hands-free, foot-activated tailgate that opens automatically and the Sync 3 navigation and entertainment system. Check out the 2.6L V6 engine on the Sport configuration of the Edge. This V6 raises the performance of the Edge delivering up to 315 horsepower. There are also some refined cosmetic details on the Sport Edge, including a polished stainless steel exhaust tip and a special black front grille. We like the all wheel drive capability on Sport Edge models as well. Tomball Ford would be proud to be your partner when looking for your next new or used vehicle. Our dealership is conveniently located near the Houston metro-center area, as well as Cypress, Conroe, and The Woodlands. Tomball has lots of great vehicles to select from in our inventory. Talk to one of our experienced sales associates today to take the 2018 Ford Edge for a spin.